This inside-the-beltline home had great character and bones to start with but was in dire need of updating and a better layout. 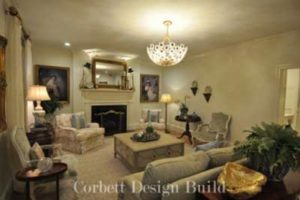 We worked with the homeowners on the home’s redesign and revamped the entire home’s layout, changing the floor plan to better suit their needs. 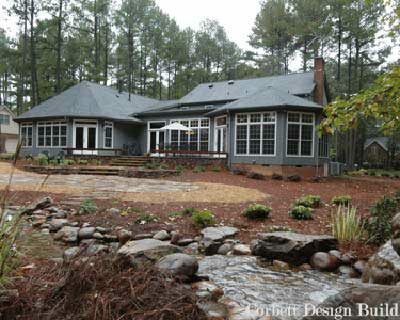 The existing home design in the Wake Project was poorly suited to the homeowners’ needs, so we worked to change the house layout in a full house remodel. 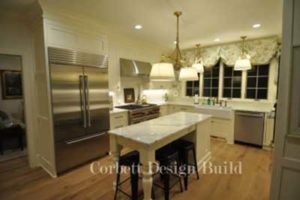 The new configuration included moving the kitchen to the prior dining room location, adding triple casement windows in the new kitchen, renovating the new dining room to open out onto a deck and adding a butler’s pantry between the kitchen and the new dining room. 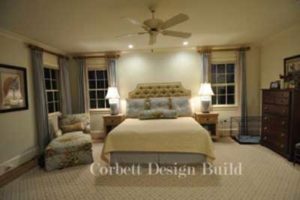 The master suite was also redesigned and a new large walk-in closet was added as part of the homeowners’ desire to improve the home’s closet systems. 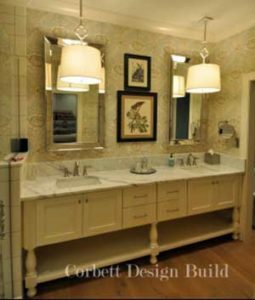 We incorporated a rear hallway from the den into a newly designed master bath space, and the hall full bath space was gutted and redesigned. The house redesign also included relocating an existing basement laundry and existing first-floor laundry to a more centrally located space on the first floor. Hardwood flooring was installed throughout the first floor and was site finished, with wire brushing and epoxy coating applied. Both the basement and attic were renovated to improve the living spaces and provide additional insulated storage space. The basement remodeling involved gutting the entire basement, removing the laundry and remodeling the bathroom. 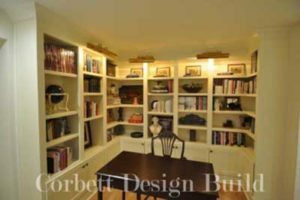 We then installed built-in library cabinets and added a home office in the remaining existing space, taking better advantage of the lowest floor of the home. The walk-up attic space was also renovated and now includes a redesigned full bath. We removed the ceiling tiles and replaced them with matching existing period wood paneling, painting everything a unifying color to pull the space together. 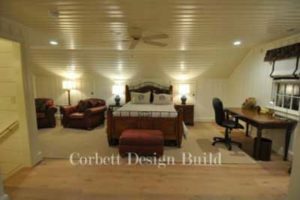 Part of the existing attic space was insulated and drywalled for storage. To improve the access path to the attic, we added wood planking on the walls going up the staircase and installed hardwood treads on the stairs. The home renovation wasn’t limited to the interior of the house, however. 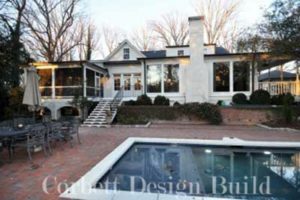 The exterior deck stairs leading off of the dining room were added and were integrated into the pool design. The exterior of the home was painted, and we added gas lanterns to illuminate the house. 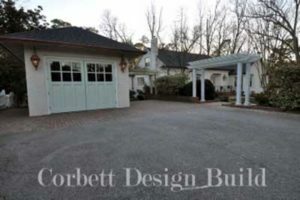 We also incorporated additional garage storage, building a small garage to match the period of the home. The new garage included open rafter tails and exposed interior framing with 1 ½” tongue-in-groove sheathing so roofing nails wouldn’t show through. The entire home was renovated top to bottom with new painting, wallpapers, closet systems, flooring, interior trim and more. The finished results are magazine worthy. 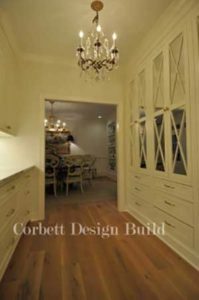 Here at Corbett Design Build, we have more than 30 years of experience renovating and remodeling homes in Raleigh, NC, and the surrounding area. 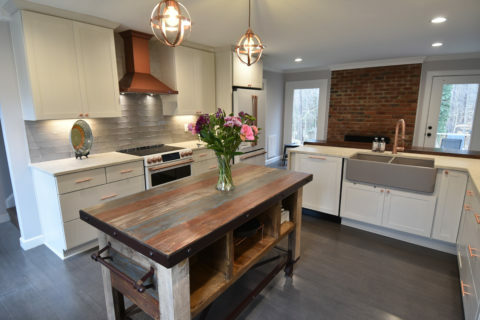 Our award-winning design team and local contractors aim to provide an exceptional remodeling experience and help you fall in love with your home all over again. If you’re interested in renovating your home, call our expert team today at 919-845-7670 to schedule your free in-home consultation!